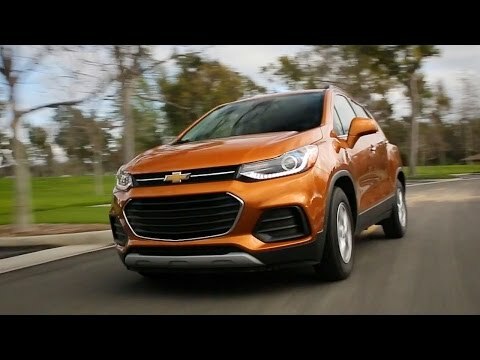 Already among the segment's most well-rounded entries, the Chevy Trax has been improved for 2017 with a redesigned front end, improved interior and new technologies including Apple CarPlay and Android Auto, making it one of the first subcompact SUVs to offer these enhanced phone-integration technologies. Great little all wheel drive car! This vehicle has great gas mileage and is comfortable. My front passenger has enough room their only complaint was they would like an arm rest. The front has one on the driver side only. In the back there is a nice fold down cup holder and pockets for on the back of seats for extra storage. The hatch back is easy to open and has plenty of room. None of my passengers have had any other complaints about eating. The vehicle is reliable and drives nice it has not let me down so far. The only con for me as the driver is the head rests in the back seat compromise the view of the rear window they are high even at their lowest position however the good side is they can be removed completely. There is a back up camera that helps eliminate that problem as well. Great little car all wheel drive car. The Chevy Trax is very overrated in my opinion. There are really no mechanical problems I have encountered as of yet. It is pretty reliable in getting me wherever I need to go. It really has very little room anywhere. The trunk is super small and the inside has very little leg room. Also, the material the seats are made of are horrible because you can't go anywhere without sweating so bad your clothes are actually wet from the sweat. The only thing I like is that you can use a flash drive to play your music so you are able to have one small device with all of your music instead of a case full of CD's. All wheel drive touring crossover. Smaller crossover vehicle with all wheel drive. Gets great gas mileage for what it is. Seating is comfortable, has many features, Bose speaker package -sounds incredible. Sunroof/moonroof- has tilt and open. Easy to use apple carplay with. Comes with built in Sirius xm- must purchase separate plan. Has Wi-Fi features built in along with OnStar. You can download maps to use the GPS navigation feature. I bought a model with a special package with leather and all kinds of upgrades. I feel this car was worth the great price.